Srinagar, May 14 (IANS) Two Lashkar-e-Taiba (LeT) militants, including one of the attackers of a military camp last month, were killed on Sunday in a gunfight with security forces in Jammu and Kashmir’s Kupwara district, defence sources said. The gunfight occurred in Warpora forest area of Handwara tehsil in Kupwara, the sources told IANS. “Following specific information about the presence of militants in Warpora forest area of Handwara, security forces launched an operation but were fired upon by the hiding militants, triggering the gunfight. “Two militants of LeT outfit have been killed in this operation,” the source said, adding that searches were on in the area to track any more militants. One of the two killed militants was the one who had escaped after the pre-dawn attack at an Army camp in Panzgam in Kupwara on April 27 that left three soldiers dead, army sources said. While two of the assailants were shot dead, the third had escaped. An army official said the fact was established by the call signs used by the militant, which matched those used by the other two. 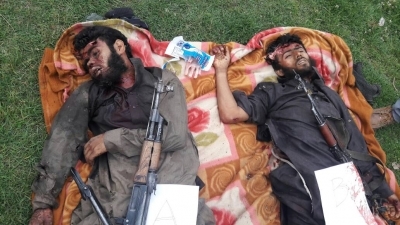 The militant also had a gunshot graze on his left shoulder blade, while the recoveries included a matrix sheet (used to find locations with the help of a GPS device), which was in series with that discovered from the two terrorists killed in Panzgam. “The terrorists killed in Panzgam had matrix sheets C4 and C6, and the matrix sheet recovered today was C3… this establishes a co-relation,” said the official. Panzgam is the rear administrative area for over nine army units in Kupwara and is spread over 240,000 square metres. The camp is about 20 km from Kupwara town and some 10 km from the LoC.